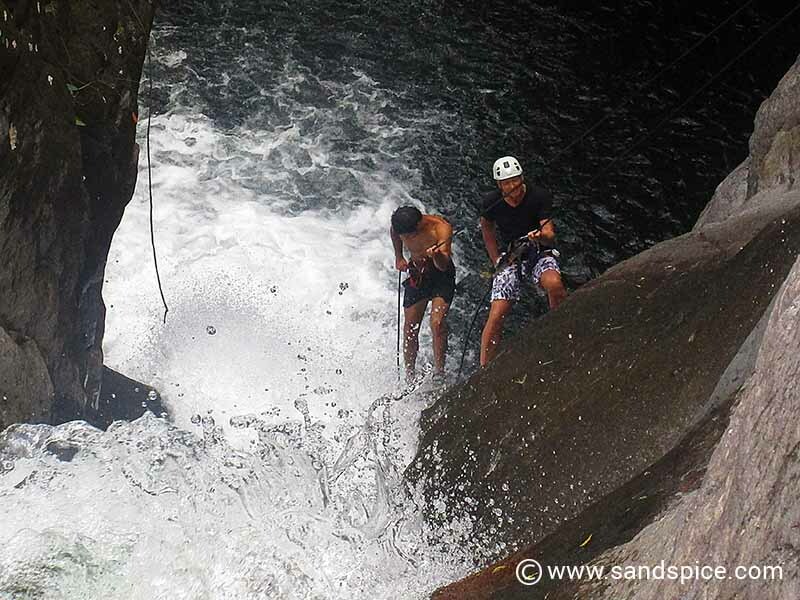 Absailing down a waterfall might not be everyones cup of tea, but for an adrenaline rush its hard to beat. 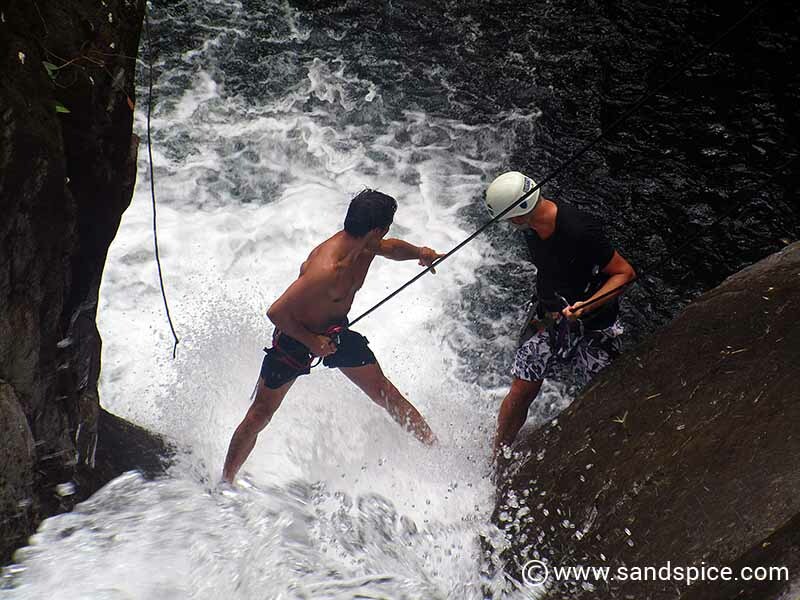 Waterfall rappelling in Boquete, also known as canyoning, is one of Panama’s most thrilling and popular adventure sports. 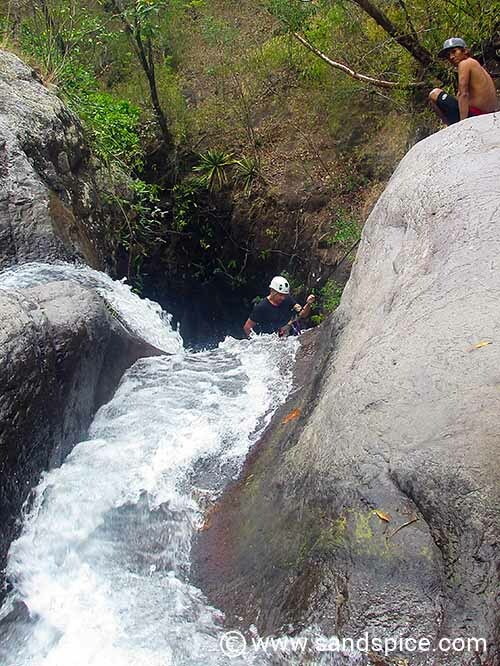 The concept is simple: suit up in a harness and belay your way down a waterfall. 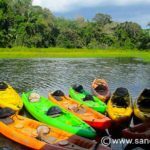 We booked this activity on our last day in Boquete, before heading onwards to Bocas Del Toro. Luckily for us we were the only participants, so we had a personalized trip with 2 guides just for ourselvses. After a 40-minute drive up into the Caldera mountains around Boquete, followed by a 15-minute hike up through a boulder field, we were introduced to the Ja Wakta waterfalls. 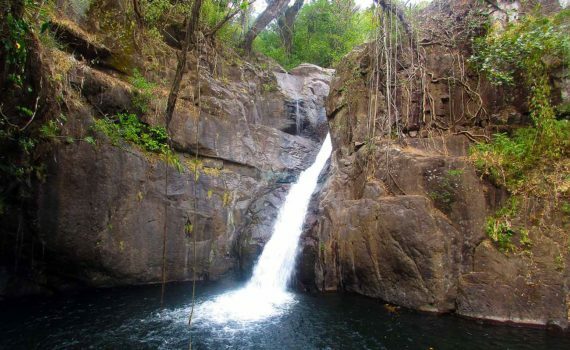 The Ja Wakta Waterfalls are set in the forests just outside of Boquete. 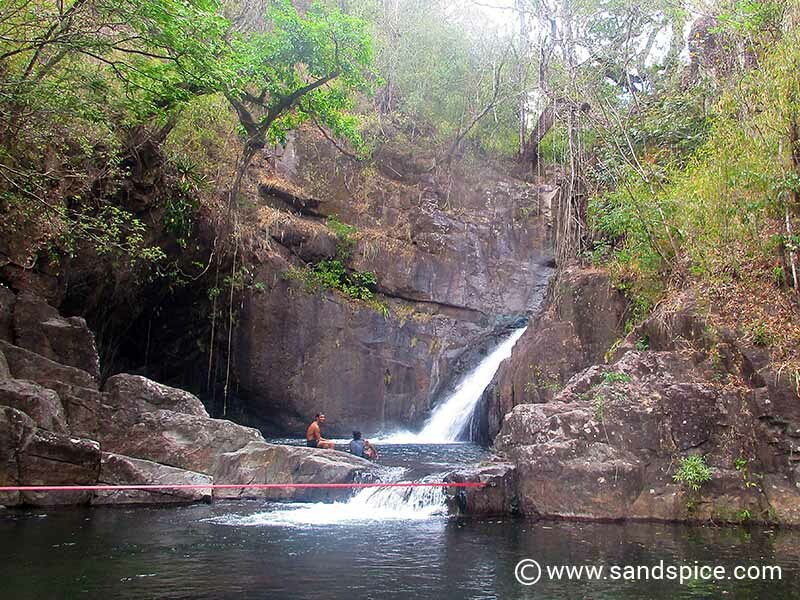 Here, you are able to swim, swing, dive, climb, and of course, finally rappel down the waterfall itself. As the river crashes through the forest it cascades into two clear pools. The largest waterfall cascades into the first pool, and there are various places on the rocks to jump or dive into the water. To calm our nerves, we first viewed the waterfall from the non-business bottom end. We took a leisurly swim in the area directly below the falls, where we could get a good view to the summit, 25 meters above us. 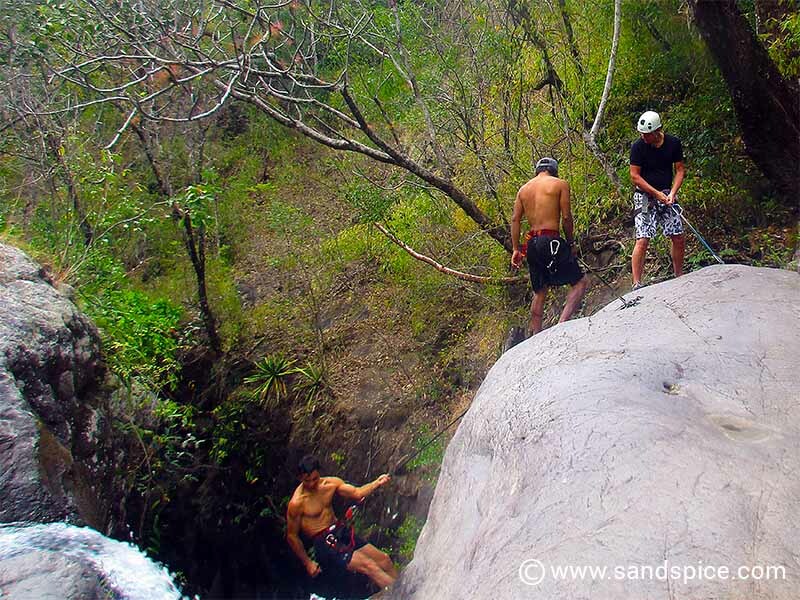 Our guides and professional instructors, Cesar and Rouen set up a slackline (a kind of flat-topped tightrope) across the lower of the 2 pools. The line is really useful for quickly traversing the lower pool, but it was also fun trying to walk along it before losing balance and falling into the water. 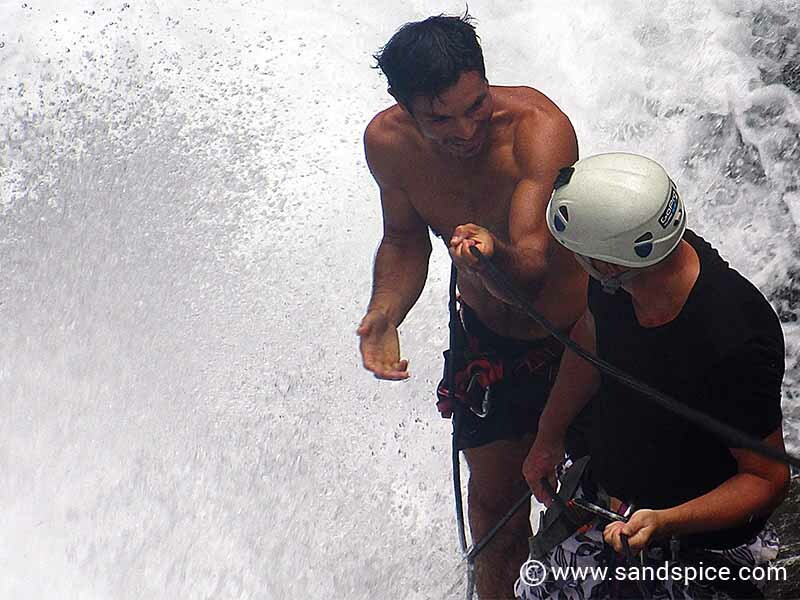 We would be rappelling down the narrow channel of the main waterfall, using the rockface on both sides to straddle the flow of water. To make matters more interesting, there was a second smaller waterfall that joined the main channel about halfway down. With the capable guidance of Cesar and Rouen, we donned our harnesses, helmets and climbing shoes. We then started the circuitous and steep ascent through the surrounding undergrowth to the summit of the waterfall. We were already pretty winded by the time we got to the top. The view from this end, together with the anticipation of what we were about to do, was enough to take the rest of our breathe away. We were close to the point of no return. At the top of the falls, Cesar instructed us on rappelling techniques, and indicated the route we would be taking down the falls. He then secured the ropes, clipped on and disappeared over the edge. A few moments later it was our turn. Without a doubt the most frightening moment of the entire experience was approaching the precipice to clip on, and then to lean out backwards over the 25-meter rocky drop towards the maelstrom below. The initial fear was soon replaced with a flow of excitement and exhileration as we descended step-by-step. Legs stretched wide across the heavy rush of the water, I hung for a while motionless across the center of the fall and just enjoyed the moment. Towards the bottom of the descent there was a tricky hop over to one side of the waterfall. This was followed by an area of mossy, slippery rockface before reaching a narrow ledge 3 meters from the bottom. All that remained was to jump from the ledge into the pool below, and swim to the shallows. This was – unexpectedly – the most traumatic moment of the whole experience. I hadn’t taken into account the extra weight of all the hardware still strapped to my body. Additionally, river water doesn’t have the buoyancy of sea water. I sank deep, breathlessly swallowing a mouthful before finally kicking myself back to the surface. I was choking for air, but the descent through the waterfall had been worth it! Since there was just the 2 of us, we had time to climb up again and make a 2nd descent before packing up and heading back down the mountain. 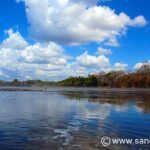 The total cost for this half-day trip from the Boquete Mountain Safari tours office for $65 per person. A fair price for an unforgettable experience. 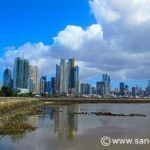 This tour is guided by local professions and lasts around 4 hours. It takes 45 minutes to drive to the entry location and another 20 minutes to hike to the waterfalls. Swimming skills are required.